Brothers in Games: Alkemy Companion, all Genesis data in your pocket. From the main view, you can access to the list of any of the Alkemy faction. Just select the right button for that. From this view, you can also access to a list of all abilities if you want to check a specific one. The last button will inform you on the next Alkemy tournaments from the Table Top Tournament Rss feeds. For this, you will need the MiniWar Tactical Companion. Get it if you don't have it, the app is free and allows you to manage your tournaments. Main view of the Alkemy Companion. If you press the Menu button on your Android device, you will have the choice between checking the websites or checking the about informations. The former will show a menu to bring you to this blog or the website while the latter will display the about view. That view needs the OI About app which is dedicated to that purpose. You can also download it for free from the Android Market. Once you choose a faction, the app will display a list of all profiles within that faction. Each element shows the name of the profile, its title if any (but for an unknown reason for now, the title disappears sometime once the add appears), the point cost, the limit of miniatures allowed or it mentions if it is a character, and the health values. The informations displayed there are the same as those displayed on the list in Architekt. Trom this view, the back button on your device will bring you back to the main view. A tap on an element will display the profile view. 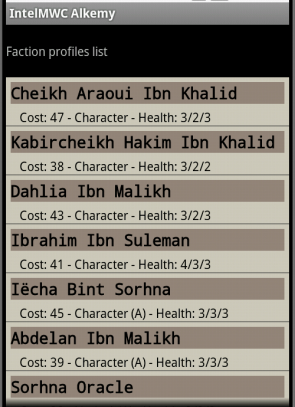 Profiles list of the Khaliman Republic faction. Each item in the faction list is a clickable element which will display the details of the selected profile. The detailed view contains all the informations about a profile. 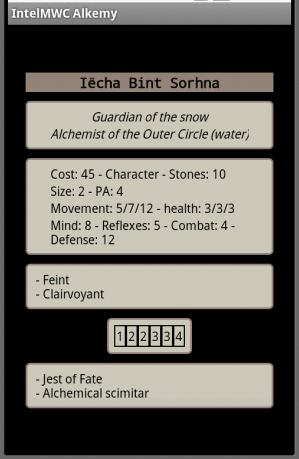 From top to bottom, you have the name of the profile, its title if any and/or its alchemical rank followed by its element if it is an Alchemist. Then you have all the profile's characteristics, which are the cost of a model, the limit of allowed miniatures or the mention if it is a character, the number of stones it possesses if it is an Alchemist, the movement, health, mind, reflexes, combat and defense values. 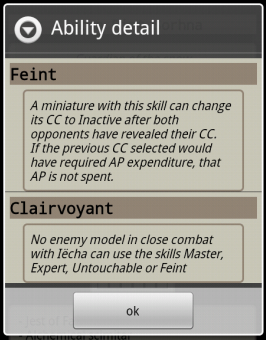 The next block is a list of the abilities of the model. 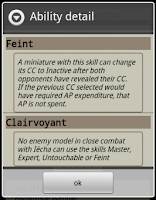 This list displays only the name of the abilities (with the specific values if any), but it is clickable. Tap the block to display a dialog box with the name and details of every ability of the model. Use the Ok button or the back button from your device to close the dialog box. The next block is the damage table. The first line is the Close Combat damages, the second if any, is the Ranged attacks damages. We know that the display lacks the symbols informations. This is part of the upcoming improvement. Damage table of a profile with CC and RA attacks. 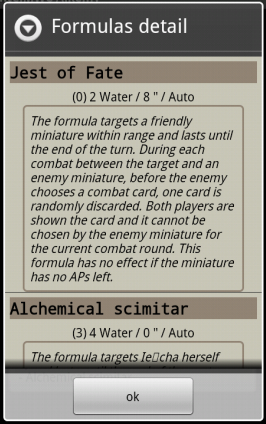 The Alchemists have a final block which is the formulas list. Just as for the abilities, this is a clickable block which will display a dialog box with the details of all the formulas. So, each item displays the title of the formula, a line displaying the focus level, the components, the range and the threshold, a block describing the effect and, if any, a list of enhancements. Just as for the abilities, click the Ok or the back button to dismiss the dialog box. From the profile view, press the back button from your device to go back to the faction list. So, as you can see, you have access to all the informations about every profile from this app. But we know that the data display have a lack of clarity. We hope to improve that in the next releases with a focus on the graphic design.